Rockpool Bar and Grill is not exactly your average kids’ restaurant. Then again, our ten-year-old Nick is not your average kid. And although the odometer officially rolled over six weeks ago, hectic schedules kept us from delivering on our promise to take the lad out for his long-promised tenth birthday dinner until just this week. Happily, he’s taken it upon himself to write up the experience. Ladies and gentlemen, Prick With a Fork gives you a guest post by … Nick With a Fork! I went to the Rockpool Bar and Grill for my tenth birthday yesterday and was overwhelmed by the good quality service and design. This meal was provided by my great family. The moment that I stepped through those doors I was flung into a world of beauty. The seats were comfy, the roof was held up by marble pillars, and even the menu had a touch of colour. First came a few slices of brioche with the creamiest butter you could ever imagine. It is apparently customary to tear an extremely small piece off and eat it with a dab of butter. 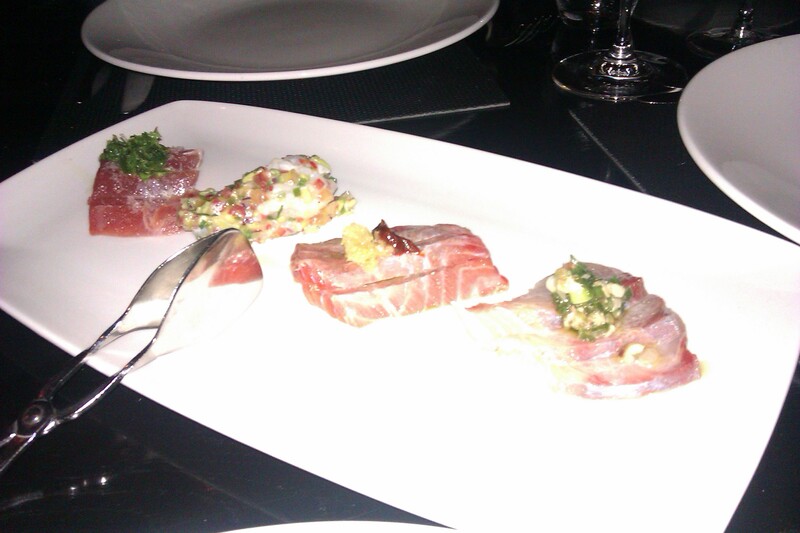 As a starter I picked out the “Four raw tastes of the sea”: First, a fatty tuna with a elegant touch of fresly harvested salt, then, a beautiful slice of ocean trout which had a completely different, more intense flavour. After that came a seafood civiche with a touch of coriander and cumin, and finally a very soft and delicate piece of kingfish which tasted like seafood at its best. We then ordered a dozen oysters, six Pacific, and six Sydney rocks. The Pacific ones had a very steely flavour, it tasted like an edible robot. The ones from the rocks however, were much smaller but I must say I enjoyed them much more then the others. All of the oysters were served with a dash of mignonette sauce which was a beautiful garnish to the dish. One of the waiters noticed my great interest in food and offered to give me a tour round the kitchen. I agreed and walked with him past the great Salamander oven, whose burning tounges of flame which are at over 200 degrees celcius leaped out and perfectly finished the steak off. Then there was the fish station, where sizzling hot plates evenly cooked the meaty surfaces laid upon the oven, and there was the gigantic sous vide machine which gleamed in the burning inferno that is the kitchen. A few minutes later came the steak, some macaroni and cheese and some fries, served on shining white dishes and cut with knives of sparkling silver. As the steak touched the very surface of my tounge I explored a whole new world, it had an extremely crisp outside, whilst the inside had a tender, juicy feel. It was very rich, cooked medium rare and bursting with flavour. The macaroni and cheese was beautiful, topped with bread crumbs and enhanced with something that I detected as tomato. I loved the fries too, please keep in mind that they are much better than chips, salty, with easily tasted potato and a soft centre, next time if you have a choice between chips and fries, choose fries over chips. 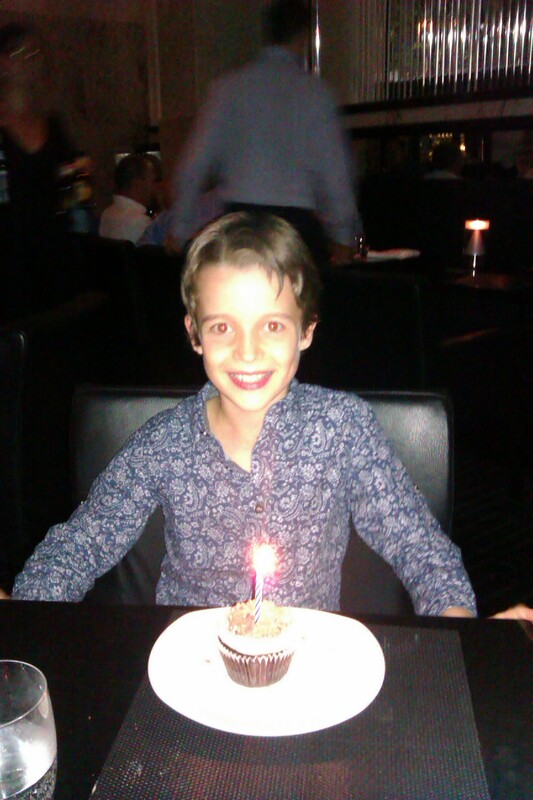 As I told you, I was there for my tenth birthday and the waiter must have heard me mention it because the chefs especially made me a cupcake without asking. How many resturants have you been to whose chefs do that? The cupcake was extremely light, not the sort of junk served at average resturants and was very creamy. I got it for free which broke the rule that nothing was “on the house”. The Rockpool Bar and Grill is a brilliant resturant dedicated to filling the bellies of hungry customers and I have all these reasons to prove it. I’m a keen amateur foodie myself, however it would take several good bottles of wine to have my vocabulary extend to food descriptions as eloquent as this 10 year old. Your next task, should you choose to accept, is a review of the best curry in Sydney. I await the results with lightly garnished and tenderly sauteed breath. Your kid writes better than most.